Version 1.12 of ShotBOT has been released. Check out the release notes. 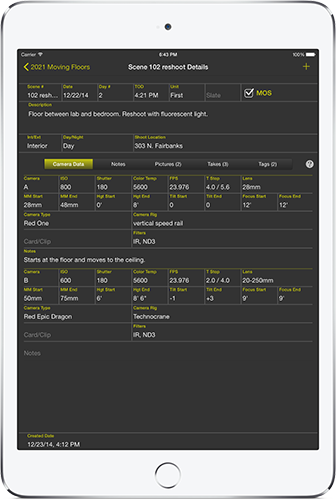 ShotBOT is an iPad app designed for professional visual effects supervisors to capture all the on-set meta data during production. It has been designed by someone who has 20 years of experience shooting visual effects and taking them through post. This app is designed to handled all the different work flows from a feature film, a spot for broadcast, or a music video. When you wrap production, print or email a comprehensive shooting report as a PDF. Even include all your reference images as part of the report. For more complex post production workflows, export your data so you can import it into your own tracking software. You can see a sample report here. Advanced features are sold as in-app purchases, so you only pay for what you need. For more information on ShotBOT, please check out the screencasts section of this web site. If you have questions, check out the FAQ section. It covers the most common questions we get. We would love to hear from you! You can call or email us from the contacts section of the site.